Meet Laura Henson, Registered Dietitian and blogger at Graceful Nutrition. Her blog name suits her perfectly – graceful is definitely the energy I get from Laura. She and I have been corresponding for a few months now and I am in awe of how talented she is at putting words together. She is well spoken and expresses herself amazingly. She and I have a shared love for the study and application of mental health for physical well-being and looking at health through a wider lens then just what foods you eat. I am so pleased she has agreed to share her wisdom here on the blog today! I especially love her topic of choice and agree wholeheartedly with the importance of family meals and allowing them to bring loved ones together. It’s so gratifying to work with individuals, mothers especially, in implementing a non-diet approach that brings them back to the table with their family. Food can and should bring sociality and time to connect with others; a meal shared can be nourishing and healing in it’s own right. Sociality with food can often feed our souls – an aspect of health not to be forgotten. As an aside, be sure to click on the embedded link below to take you to Laura’s blog post on The Principles of Mindful Eating – one of my favorite articles of hers. Take it away Laura! Mindful eating may seem difficult to do when you have a family. In your past dieting days, you may remember times when you had to eat a completely different dinner than the rest of your family and felt singled out. Or a time when you decided everyone was going to start “eating healthier” and you prepared your diet meals for the whole family, only to have them complain about the meal and ask for something else. Now that you have decided to give mindful eating a try, you may feel like it will be like all the other times you tried a diet and mealtime became a time of frustration instead of enjoying it with the people you love the most. The great thing about mindful eating is that it has nothing to do with what foods you eat. 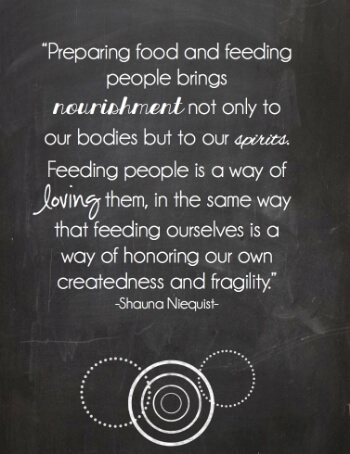 It addresses why and how we eat. This gives you the freedom to share a meal with your family that tastes good and everyone can enjoy. You can apply the Principles of Mindful Eating to any meal you eat. The added bonus is that you will have the opportunity to be a role model for other family members. They will see from you that all foods can be a part of a healthy lifestyle. So what are some easy tips to help you incorporate mindful eating into family meals? Have your family help you prepare the meal. They can help with the whole meal or just one part, such as a side dish or dessert. This will help bring awareness to the process of creating their meal. Prayer or not, just taking a moment to be thankful for the meal in front of you sets the stage for a more peaceful mealtime with family. Eating with the TV on or with your cellphone at the table distracts you from the act of eating and can lead to mindless eating. This may not be possible for every meal with family, but even one uninterrupted meal a day can make a difference. It is easy to get into a rut when it comes to planning meals. Switching up cuisines or adding something simple, like a new spice or vegetable, to a familiar meal can reawaken your palate and take the boredom out of mealtime. I hope these tips will help make mindful eating as a family easy and enjoyable!